A week after my debut with the Santa’s Singers, we were at it again, but this time at the British Embassy Xmas party, on Saturday 7th December 2013. Notice the Ambassador himself has joined the choir here to sing a few songs with us! Once again as always thanks to Mike and partner for the filming, Ian for the choir mastering, and the Santa’s Singers for making xmas more xmasy this year. Many thanks to the ABCC and the Embassy for having us as well. My singing of songs took on a whole new plane last year when I joined the Santa’s Singers. Unfortunately ( 🙂 ) I spent the whole of December 2012 in Peru and so couldn’t join the singers at any of their yearly carolling events. 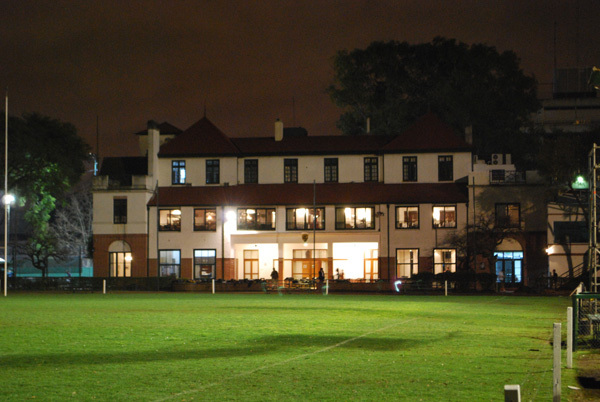 But this year, after two hard months of weekly rehearsals, I made my Santa’s Singers’ debut at the Belgrano Athletic Club. Unfortunately, since I’m a tall bass and so stand at the end of the line, I spent most of the gig behind a lampshade, but you can enjoy my left ear at times. And if you know my voice you might be able to distinguish my dulcet tones at certain more confident moments, although I was rather quiet tonight as it’s been a long time since my singing voice has been on stage, even among such supportive companions. Many thanks to Mike and his wife for organising the filming of the singing. And congratulations to my companeros for being such a great choir and welcoming me with open arms. And a special mention to our choir master, Ian, for leading us to heights undreamed of. Is it gonna be here? Is it gonna be there? Here are all the materials you need to enjoy ‘Surviving through Song – words of wisdom for EFL teachers’ which I’m presenting as an IHWO Live Online Workshop this September – Enjoy! I’m hoping to post blogs about each of the songs used in the workshop, but having done a couple of them, I can see it might take me a while to do them all, but hopefully we’ll get there eventually. I hope you enjoy the workshop – if so, please do leave a comment and tell a colleague about it! At #IHTOC50 (International House Teachers Online Conference) on Friday May 25th, up to 500 IH teachers from around the world came together to share their experience, knowledge and love of teaching, as well as to celebrate fifty years of teacher training at International House. I was lucky enough to be heavily involved in organising the whole conference, in my role as Academic Coordinator for Resources and DoS Support, but I also gave one of the plenary sessions on the day. I then gave a slightly different face to face version of the session at the Anglo conference in Montevideo on Sunday 19th August, with the kind support of Macmillan Uruguay. This session included the observation tasks you’ll find below, but I left out Ask by The Smiths as the song of The Eighties and left that up to Just Like Heaven by The Cure. The idea behind my session was to give some sound advice to Newly Qualified Teachers (NQTs) about how to survive in their early years of teaching, based on my experience as an NQT myself back in Prague in the late nineties, and then as a senior teacher and DoS helping new teachers settle into their new careers, and most recently as a CELTA trainer sending new teachers off out into the wide world of ELT, and also as a DELTA trainer, welcoming not-so-new teachers back into the fold for further teacher development. Since we were celebrating 50 years of International House teacher training (the first teacher training course took place at IH London in June 1962 and would later develop into what we today know and love as the CELTA), I thought it would be fun to look back over the best music of the last fifty years to find some inspiration. Then it occurred to me that using song was a great way of ingratiating yourself with your students in your early years of teaching, so why not pass on a few ideas about how to use my chosen songs in the classroom at the same time? And then during the planning stage and with some great input from people (mainly my former IHCAM and DELTA trainees) commenting on my previous blog post ‘Turning CELTees into successful NQTs’, I realised teachers may also appreciate some help with reflecting on their own teaching, both through self-observation and peer / DoS observation. So I ended up with a song from each decade of the last fifty years and one for luck. And for each of these fab songs, I had advice for new (and not so new!) teachers, a lesson for using the song as listening practice and as a springboard for speaking or language activities, and also an observation task that can be used to help teachers improve in the area inspired by the songs. To go through each of them here would make for one incredibly long blog post, so instead I’m going to try and post about one song/decade/idea on a regular basis over the coming weeks. And as I do so I’ll add links to each of the posts here below so you have an index to all of them in one place. The session seemed to go down very well and people said they found all three aspects of it useful, so I hope you find something useful in there too. If you do, please let us know with a comment. And then if you have other songs you’d like me to dish out the same treatment on, do let me know about them too! Enjoy! Don’t suppose that you could tell me? Don’t suppose you’ll ever know? Make a choice or let you go. Not fair am I to keep you like this? Not fair is it to make this my truth? Don’t imagine that you’d leave me? Don’t imagine that you’ll ever let me go? Make it fairer than it was before. Don’t you think I’d know the answers? Don’t you think I’ve been here before? Don’t you know I’m turning you over? Don’t you know I’m out of time? Making it up while it’s still too soon. It’s not fair, it’s not fair, but it’s the truth.